You've seen a pop-up book before right (a paper one, that is)? Here is the digital equivalent. Over the past couple years a number of publishers have been experimenting with augmented reality apps. Do you know how movie makers can add CGI to film and insert imagined creatures in among the real actors? In augmented reality, you can do that in real time with your webcam. Check out the video below. This is something that is easier to show than say. 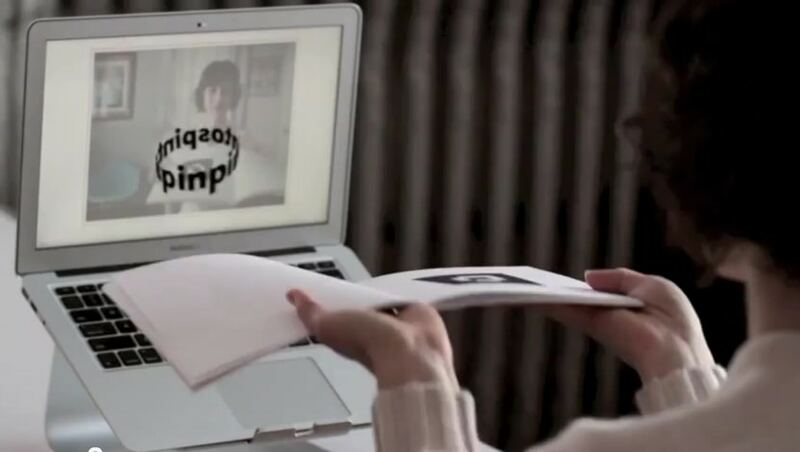 As you see, the video shows a digital pop-up book. It's a demo for Between Page and Screen, a new book that has just been released. The gimmick here is that the pop-up words are poems that are sent between 2 lovers. You hold the book in front of your webcam and you'll be able to see the poems on your screen. If you want to see it in action, there's a sample that you can try. I like the idea but I don't think this implementation works all that well. I tried the sample, and I found that I had to hold the sample at a minimum of 30 degree angle for it to work. The demo video above fudged a number of details; I could not hold the sample as flat as that book was held. It stopped working when I tried. The angle and position of the sample wasn't terribly convenient. I did eventually figure out where to position it between me and the screen, but the book wouldn't be as convenient. But don't take my word for it; go try it. It's worth a few minutes of your time. All in all, I like the idea, just not this particular book. But I recall seeing something similar back in 2010. That book was called The Search for Wondla. It seemed to work better, so I'm going to go get a copy and try again. I guess i’m too old to appreciate a concept in which you now need a computer AND a book to read something. I can’t read the book without the computer (or tablet) and if I have the computer it could simply generate the text without me dancing a book in front of the camera. Good God take me now.